FotoJet is an online graphic tool for collage making, graphics designing and image editing. 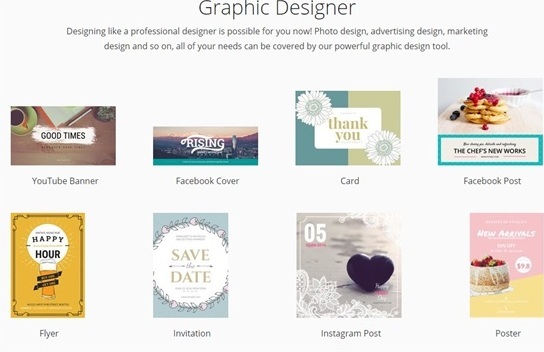 Collage maker and graphics designer help you turn your photos into amazing collages, photo cards, social media graphics, posters, flyer and then quickly share with family and friends via Facebook, Twitter, Pinterest or Tumblr. You can even save your creation on your computer or print them out directly. Fotojet provides 600+ creative collage templates, 80+ classic collage layouts and 400+ professional designs. 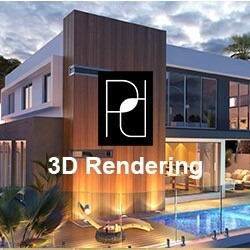 It works perfectly in any browser without the hassles of downloading and installing. In COLLAGE mode, you can make a classic collage, creative collage and all kinds of themed cards. You are provided with 80+ fully adjustable classic layouts and there are 600+ creative collage templates you can use, such as Modern Collage, 3D Collage, Photo Card, Magazine and so on. You can also create birthday cards, anniversary cards, thanksgiving cards etc. To create a collage, you just need to choose a template/layout you like, easily add favorite photos, and apply other elements like texts, clipart images, shapes and background resources. When you’re done, simple save, share or print your collage. Even a computer novice can use FotoJet to effortlessly make beautiful collages. In DESIGN mode, you will find 300+ professional designs, including Facebook Cover, Facebook Post, Instagram Post, Twitter Header, YouTube Channel Art, and Poster, etc. 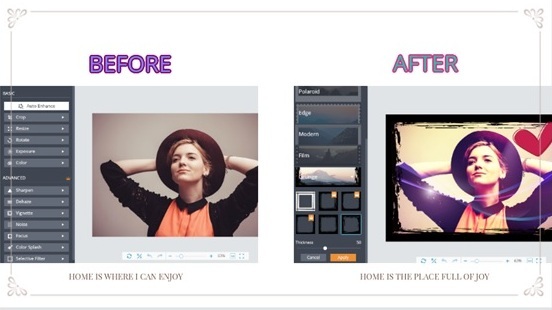 It’s flexible to customize your creations with photos, texts, online clipart images, lines, shapes and other elements. Under designer, you can play with your creativity freely to make gorgeous photo designs and then save, print or share to social platforms! In Editor mode, you can perform both basic and advanced edits to photos. You can use it for cropping, resizing and rotating to arrange your photos perfectly. It’s very convenient and easy to change the photo’s exposure, brightness, contrast, highlights, shadows and make color adjustments like saturation, temperature and tint with just a few clicks. You are allowed to unleash your creative inspiration by adding Sharpness, Vignette, or setting Radial Focus and Tilt Shift to clear focus. What’s more, you can add selective blurring effects, overlays and frames to photos. It is very simple and easy to learn how to use FotoJet. What you need to do is select the mode you want to use, and then choose template you like, add your photo and make some adjustments. With a few simple mouse clicks you can create beautiful photo art within a few minutes. If you wish to enhance your photo with wonderful effects, overlays, and frames quickly, then FotoJet is a great choice for you. Or if you would like to create beautiful and fashionable Facebook covers, posters or flyers, then I have to highly recommend FotoJet.